Been a fun fall of shooting Mother Nature dining out. Started with the Heron and Pike images. Now here is another image of the cycle of life. Had the opportunity to fish below Tippy Dam for Brown Trout. While working on a few patterns that that we will be adding to the Hawkins YouTube channel here this winter. 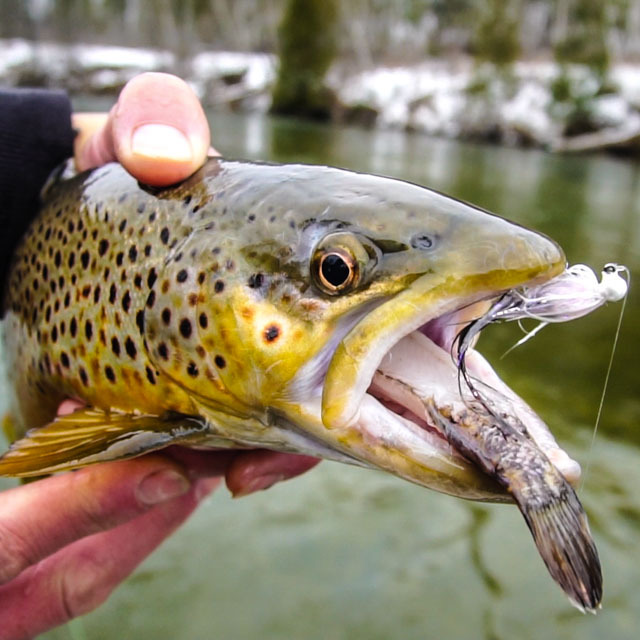 I shot some video of the flies in action and then extracted this still image of the brown trout showing off his main meal, with my small dinner mint sized fly in his mouth. 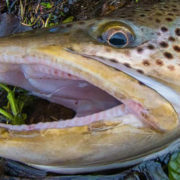 What minnow did this Brown Trout eat? A new line was introduced in the past month the SA Amplitude Smooth Infinity and have had the pleasure to test it out over the last month. Line showed up during Hex Season, even though my go to line for Hex is the Magnum Glow Line, but I have a few days each year that allow daytime fishing of the Hex Hatch. Turning over big dry flies into tight quarters is a must and the New Smooth Infinity was up to the task. During the last thee weeks the line continues to bring it’s A game to Northern Michigan. 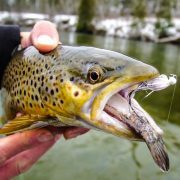 With the foam bite (hoppers, ants, and beetles) mixed in with twitching (small streamers on a floating line) these two methods are a huge part of my summer program for trout. Having a line that can deliver dry flies to within inches of a log, but still has the energy to turn over a small weighted streamer with a tungsten cone head into a deep pool. Is a must for me, nice to have confidence that the SA Smooth Infinity can do both without missing a beat. 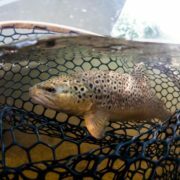 If you have ever spent much time with me in the boat, and we talk equipment you know how I feel about fly lines, it is the most important part of your equipment! 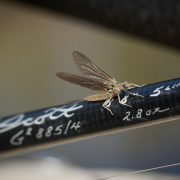 Make sure to stay on top of the latest technology and check them out at your local fly shop. Also if you see me on the water and want to take a test cast just ask. There’s a reason we call this line the Infinity: there is no end to what you’ll be able to do with it. 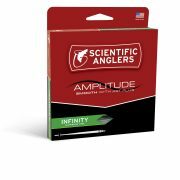 The Scientific Anglers Amplitude Smooth Infinity taper is a half-size heavy freshwater line built for everything from panfish to pike. 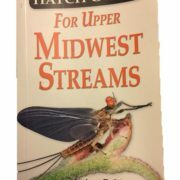 With a long rear taper and extended front taper, it’s delicate for dry flies, has enough power for streamers, and can mend line for nymph rigs with equal ability. Built with the AST Plus slickness additive, Infinity lines are 50% slicker than any other SA line, and will last, on average, eight times longer than any line from the competition. Remember: REAL NERDS GET ALL THE FISH. It’s a few days behind schedule but the Hendrickson Hatch has started, had a great day with Doc yesterday on the Upper Manistee beating up on some nice mid teener’s. On our journey I did a quick highlight video for the Hawkins Outfitters YouTube page. Thinking about doing more of this type of highlight video from a day’s journey please let me know your thoughts. Also please subscribe to the Hawkins Channel on YouTube as the Boyz and I have plans to do more videos in 2018 and beyond. Thank you for subscribing. Enjoying a great day down the Pine River (one of the coldest trout streams in Michigan). August can be the dog days of summer but so many opportunities abound. 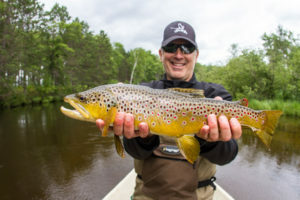 Even though we didn’t connect with any monster trout, we had an action packed day floating down the Pine River. Will do a little more talking about the Scott Radian 907 in the future , but just wanted to post a couple quick pics from a personal trout streamer day with Ed McCoy yesterday. Was my first day with 907 and so glad I bought one, great rod for the Michigan trout scene. Perfect with my 250 SA sink tip.